It's been a Halloween whirlwind this past week! We had to kick it into high gear so that we could get decorations out with enough time for people to enjoy them before Halloween. 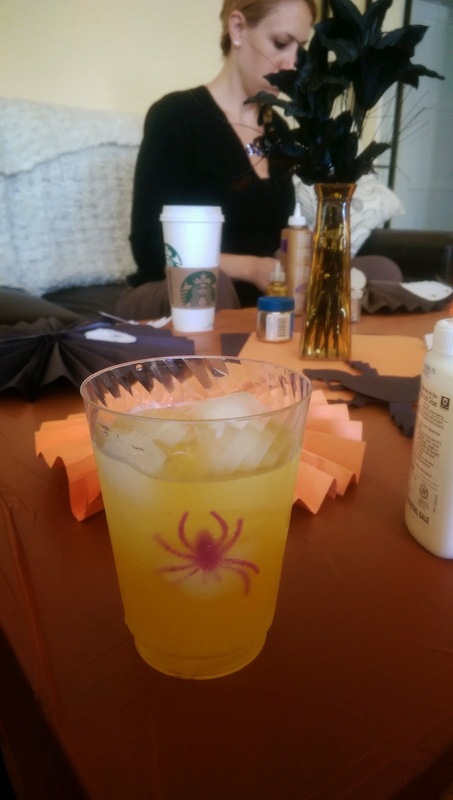 I said in the Halloween Activity Kits for Kids in Need post that I would share photos from the events, so here they are! As I mentioned, I had my second graders start the decoration process. It was very interesting finding a way to describe why we were making decorations for the children living at a (domestic violence) shelter, without explaining why they were there in the first place. All I really said was that families were living together at a shelter because it wasn't safe for them at home; the kids don't get to trick-or-treat for Halloween and only have decorations and candy that other people can give them. My assistant teacher was the first to use the word "gifts," which sounds so simple and obvious. The kids REALLY loved the idea of giving other kids gifts. 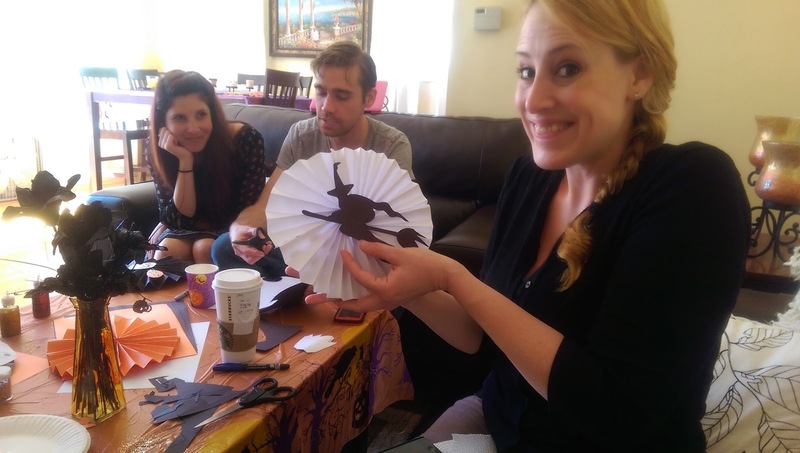 :) I showed them the project inspirations on the blog and we got to work making accordion fans! 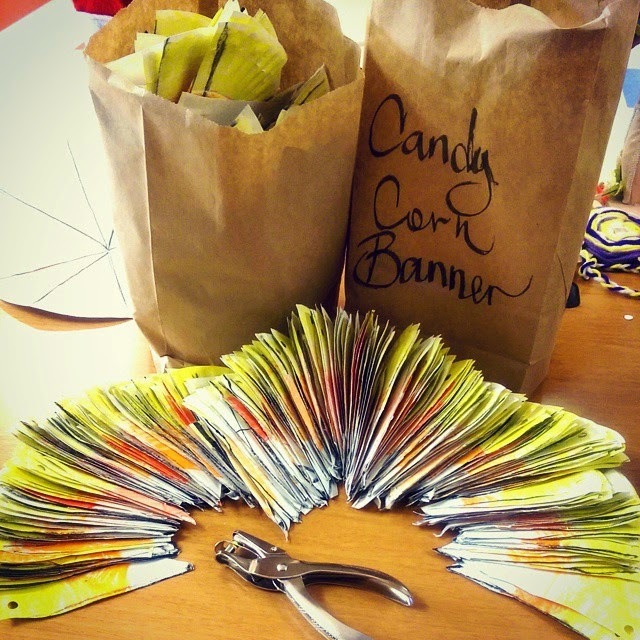 And then, when I came back from two days at a gorgeous vineyard wedding, they surprised me with HUNDREDS of candy corn banner pieces!! Then, I had some amazing local #TeamITLT members come over for a craft brunch. My co-captain prepared the MOST delicious Kaya toast and I had a minimal amount of time to set the mood. 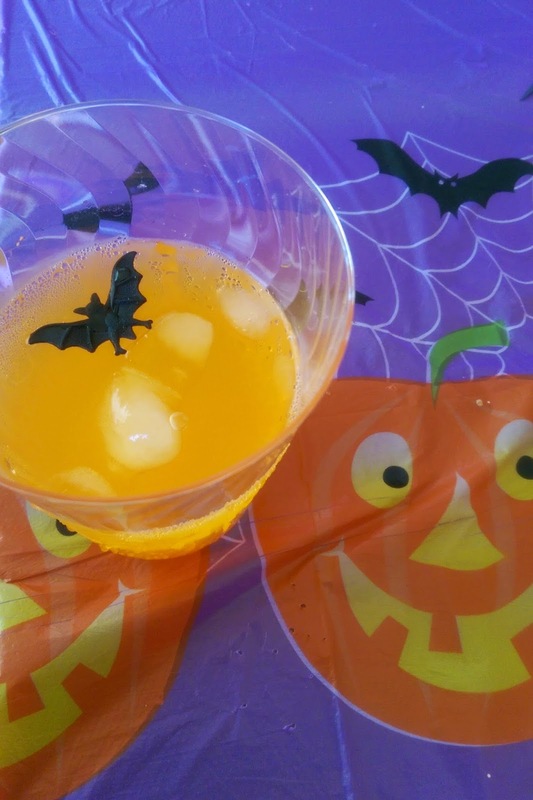 Witches broomstick peanut butter cups, painted black flowers, and spooky ice cubes... classic. 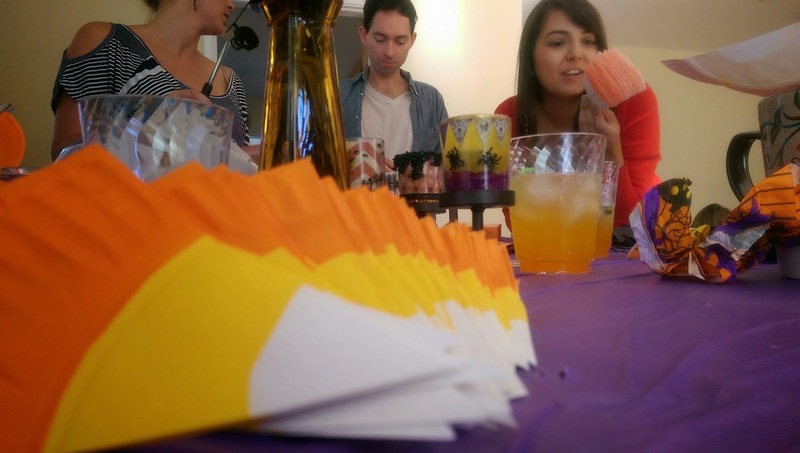 At craft brunch, we assembled the awesome work my students did, painted candy corn pieces, and assembled at least fifty goody bags. 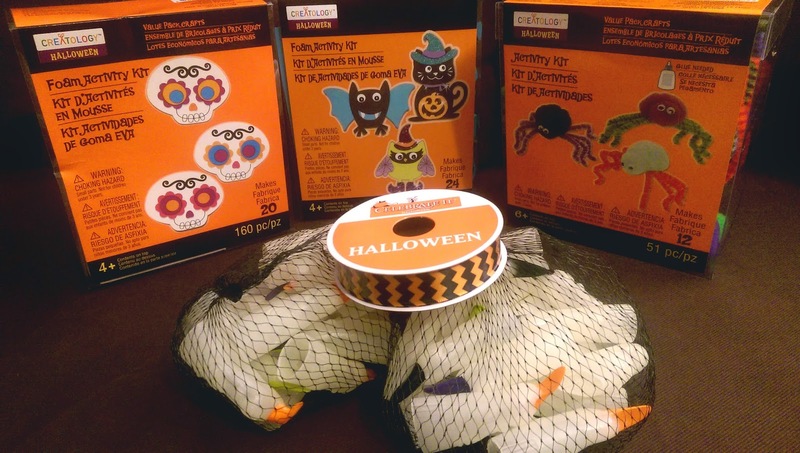 A goody bag for each child at Haven Hills included: a special activity (so they could assembly a pipe-cleaner spider, dia de los muertos skull, black cat, etc. ), a witch's finger, a spider/bat/skull ring, and at least three pieces of candy. An assembly line made this move so smoothly, what took the longest was cutting and separating the individual projects from each of the pre-made kits. Did you have a chance to try out some of these fun activities this week? Tell us about it below!! There's still ONE WEEK until Halloween! Help your local shelter have a Happy Halloween! Hey, we haven't had an "In 5 minutes/Under 5 dollars" challenge lately! Well, you're going to love this one because it's FREE and takes only ONE minute! Send a Bat-o-gram to a child spending Halloween at Children's Hospital LA. Wish them a FRIGHTFULLY FUN Halloween with one of these adorable cards below. Such a sweet idea and just a quick click away! Which makes me wonder... do YOU know of any other hospitals or organizations that make sending holiday greeting cards so easy? If you do, please share them with me. OR, volunteer to create a list of participating organizations and be a guest blogger on ITLT! 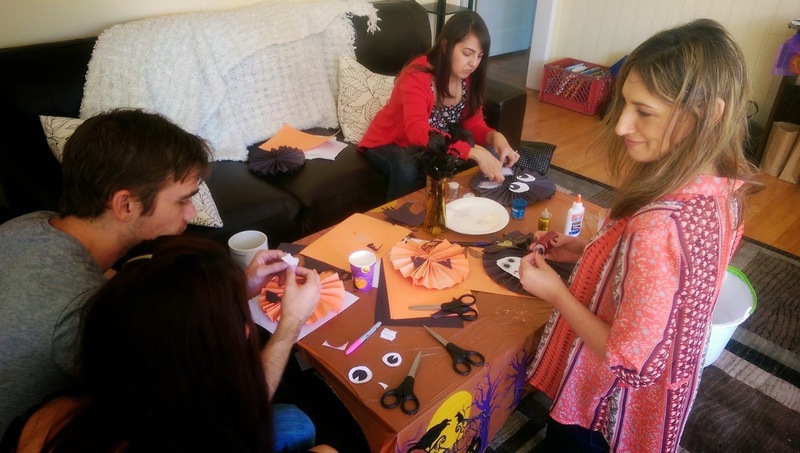 While you're in the Halloween mood, check out our decoration and goody bag ideas or hop on over to DoSomething.org for some hauntingly good fun! 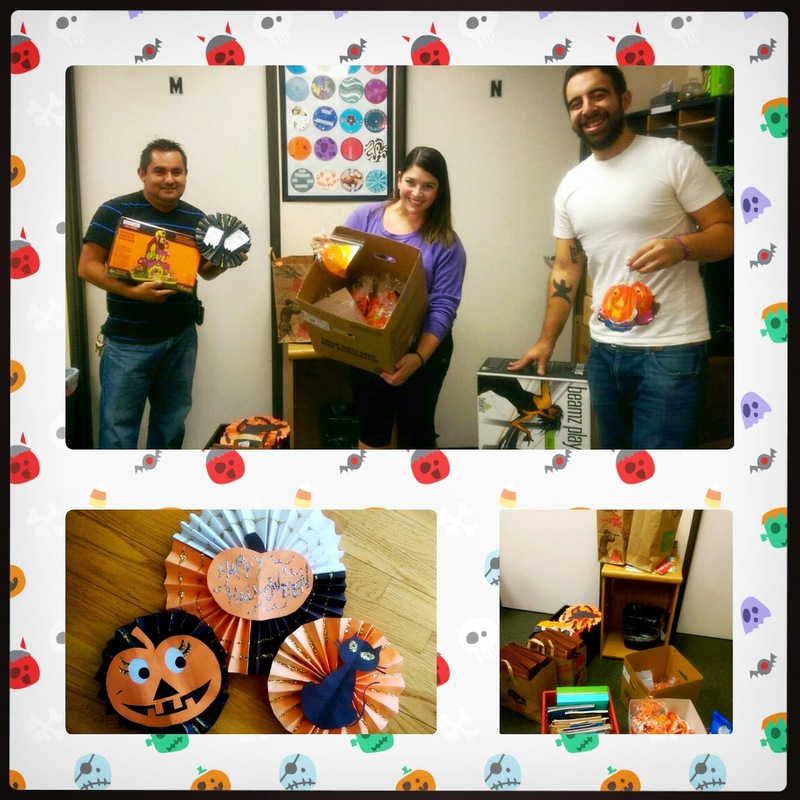 I love this project of theirs: Trick or Treat for TP. Did you know that 1 in 3 low-income American families struggles to afford basic household goods, like diapers, toilet paper, and soap? "In addition to food, food banks and food pantries provide these items to visiting families. Trick-or-treat for candy (duh!) AND toilet paper to stock your local food bank or food pantry for families in need." This is a quick update about the Bat-o-grams! This article states that over 16,000 Bat-o-grams were delivered to kids at Children's Hospital Los Angeles. THANK YOU SO MUCH to everyone who participated in our "In 5/Under 5" October challenge!! As I mentioned in our last Kids Helping Kids workshop post, Haven Hills is our local domestic violence women's shelter with nearly 40 years of service to our community. In addition to the many women they help in both their Crisis and Transitional shelters, Haven Hills also helps care for 40-60 kids at any given time. Since we didn't have enough time to put together an official Kids Helping Kids workshop, I'll be hosting a craft night with friends. All of these activities are still GREAT projects to do with kids, so have fun with your family or classroom. I've expanded on Mary's awesome suggestions and put together a list of exciting and easy crafts. There were three things that she mentioned that I wanted to focus on: decorations, treats, and activities for the kids. Of course, you can always just buy these items, but isn't it so much more fun to DIY...! 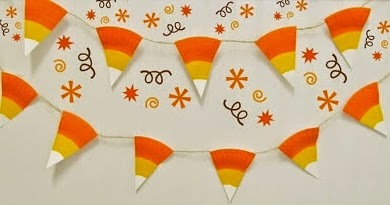 Candy Corn Banner: Now, this one is so cute, I had to share. I like that it's great for all ages: bright and not too spooky! Since we technically haven't hosted our craft night yet, but I wanted to give you enough time, I'm borrowing these great images from The Pin Junkie. 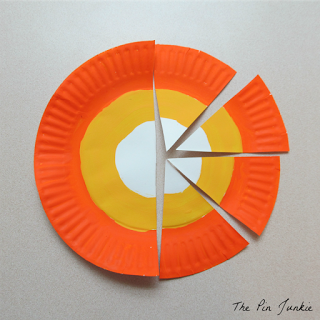 Paint the outside of the plate orange. The bumpy rim on the plate provides a good guide and will help make nice even circles. 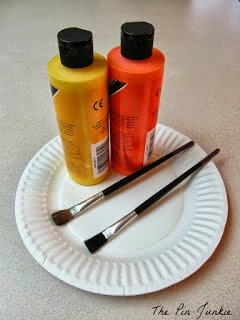 Once the orange paint is dry, paint the inside circle yellow. Leave the center of the plate white! When the yellow paint is dry, cut the plate in half and then in half again, leaving you with eight equal pieces that look like candy corn! You can use a paper hole punch to thread the twine though the candy corn and hang it up that way, or for a clean look you can simply glue or tape the paper plate pieces to twine or ribbon. You may want to have your recipients assemble the banner themselves since they'll be hanging in places that could vary in dimensions. 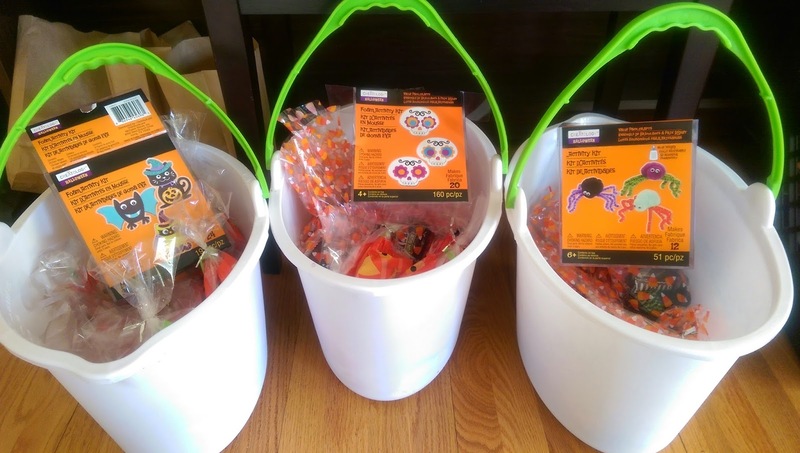 Separately package the candy corn pieces in a plastic bag along with a roll of twine (*Dollar Tree has three rolls of twine for a dollar in the home improvement aisle). You can pre-punch holes or include tape if you like as well. I'm going to make this an activity at the craft party and hopefully we'll have enough pieces to create several banners. That way, we can not only bring these decorations to the children at Haven Hills, but I can send them off with friends to deliver them to children's hospitals, homeless shelters, and maybe even a senior home. My second graders would probably love this activity too, so if you have a classroom or art time then this is a fun activity to do with your students! 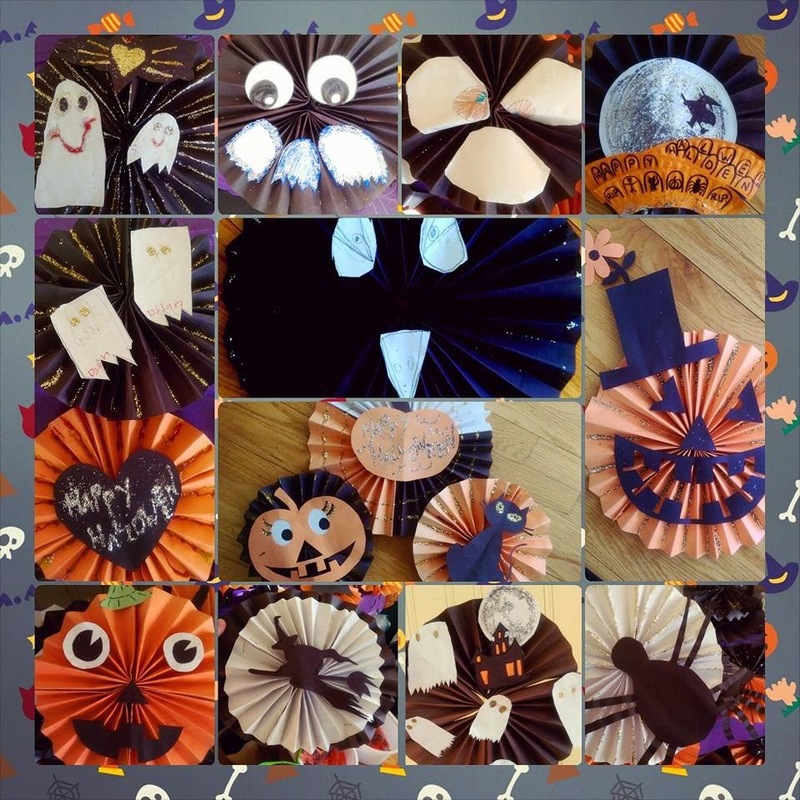 Spooky Accordion Fans: When I first thought of this next decoration project, I decided to have my students do one part, have my craft night guests do the other part, and then put them together. As neither of those have actually happened yet, I was searching online for a pictorial "how to." Originally, I planned to put spiders on spider-web-looking-fans, but then I found this Martha Stewart project that will supplement for demonstrative purposes just fine! Form circles by using one paper or two. For one paper, staple your accordion in the center and fan out both sides. Use glue or two more staples to secure the ends together. For two papers (and larger fans as pictured above), use glue to attach the ends of one paper, creating a 180 degree fan. 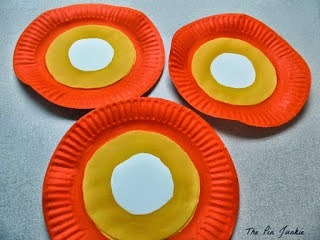 Do this with another paper of the same color, and then glue them together forming a circle. Add features to your fan. I'll be having my students create spiders to put on web-like fans. 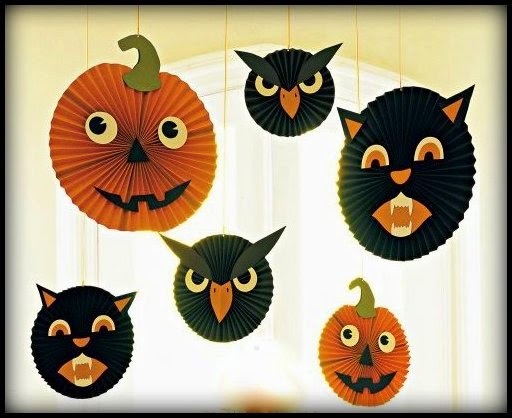 You can also print these templates (pumpkin, cat, and owl) from Martha's website, enlarging by 125 percent for small circles, 150 for medium, and 200 for large. Cut them out and trace the shapes onto colored paper twice. Cut those out and attach the shapes to the decorative fan with (hot) glue. Hole-punch the top, and hang using ribbon or twine! I'll be sure to update photos when we have our craft party this weekend! If you're a Michael's maniac like I may be... then you might have a few chocolate molds already! Don't worry, I only have them for Halloween and Christmas. I picked up some Wilton Candy Melts today in black, orange, and lime green - on sale now for $1.88 (compared to $2.99 I think). The molds I already have are stacks of pumpkins, creepy finger nails, mummies, etc. 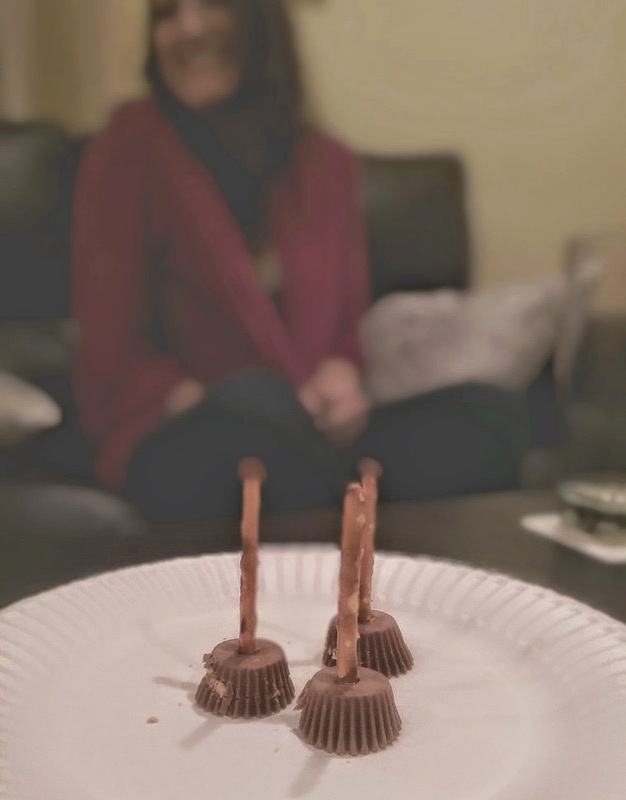 At the craft night, we'll fill them with different colored chocolates and insert in a lollypop stick or pretzel rod before they cool and dry! If you're trying this at home, just be sure to follow the exact directions on the back of the candy melts pack; don't add any ingredients or heat any differently! Pops can be packaged in individual bags or you find out if the organization can accept them on a platter. We're making enough for about 50 kids, so I'll be calling the community manger at Haven Hills this week! This part I just love because I know what an important role Art plays in healing. I may have splurged a bit, but I wanted to give the kids options! First, I got three 3D foam assembly kits from Michael's: one large and two smaller. The large one is a super intricate haunted house; with 100+ pieces, this will be great for the teenagers. The two smaller kits will be great for those elementary and middle school aged kids; one is a ghostly pirate ship and the other is a piano and spooky tree! All of these are on sale at 40% off already ranging from $6-12 each. For the youngest ones, I grabbed sticker books - over 1000+ total - and mini magical paint posters. 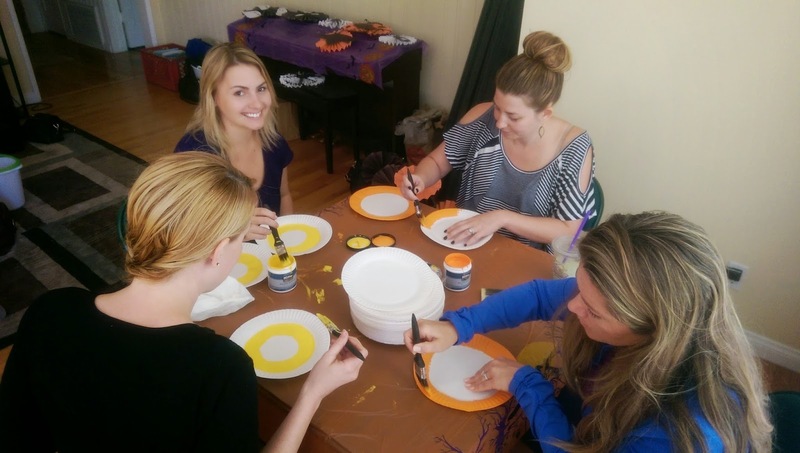 They're magical because no real paint is required; a water-dipped cotton swab or paint brush means no mess! 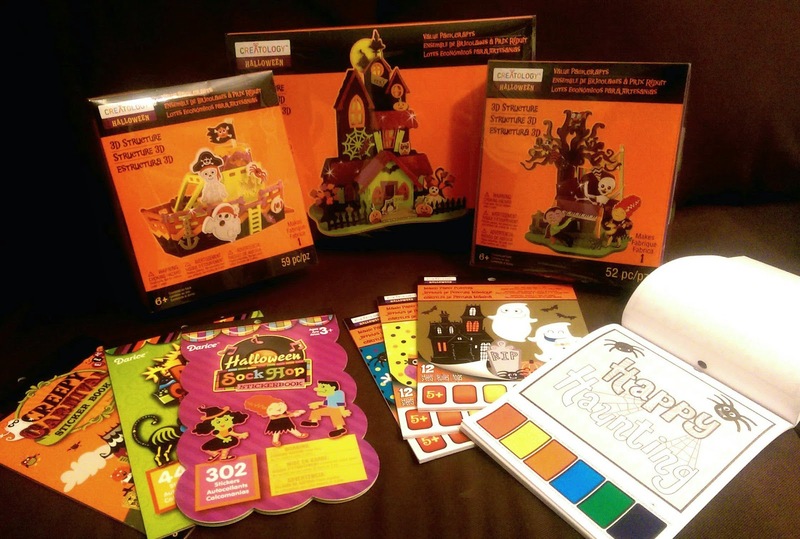 Because I couldn't stop there, I picked up a few more activity kits and witchy fingers (pictured below). At the craft night, I'll be asking my guests to help assemble craft kits for each of the kids. 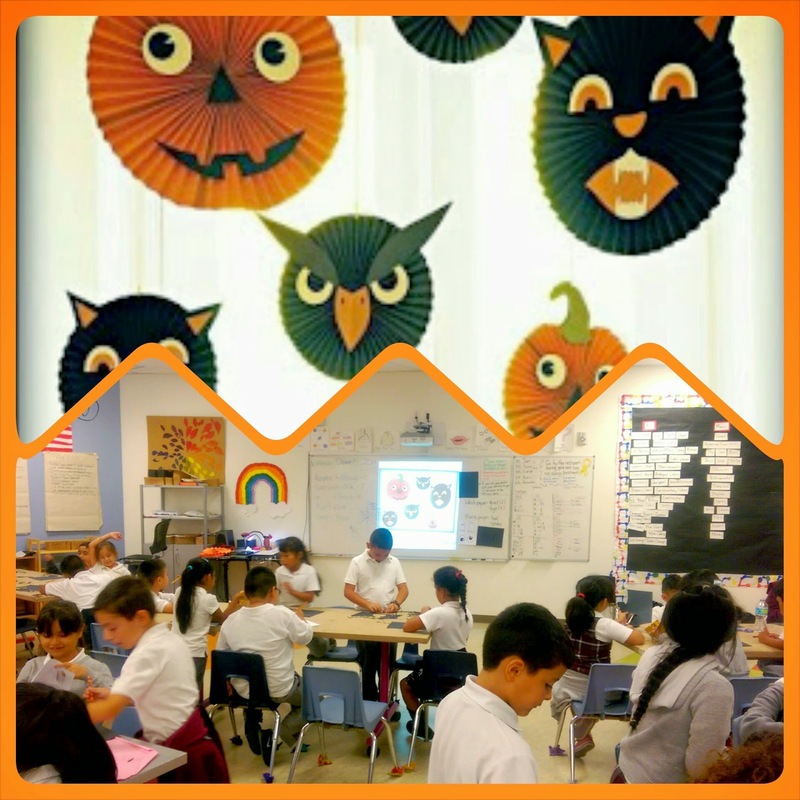 We're already providing decorations for them, but I want to make sure they have a hands-on opportunity to create the spirit of Halloween! What I really loved about our previous Kids Helping Kids workshop was that each bag was designed and created for a specific kid at the shelter in mind. I want to make sure that we take the time to give each child their own personal craft bag filled with: a fun activity, a witch's finger, and some Halloween candy. I think it's important for each of them to know that someone packaged that goody bag especially for them. a children's shelter or hospital? Do you have other spooky decorations, tricks, or treats that you'll be sharing in your community? Let us know in the comments below! And as always, if you participate in this project, let us know! Sharing your photo, tag us @itsthelittlethingsdotme, and hastag #TeamITLT. Project updates is now available here. 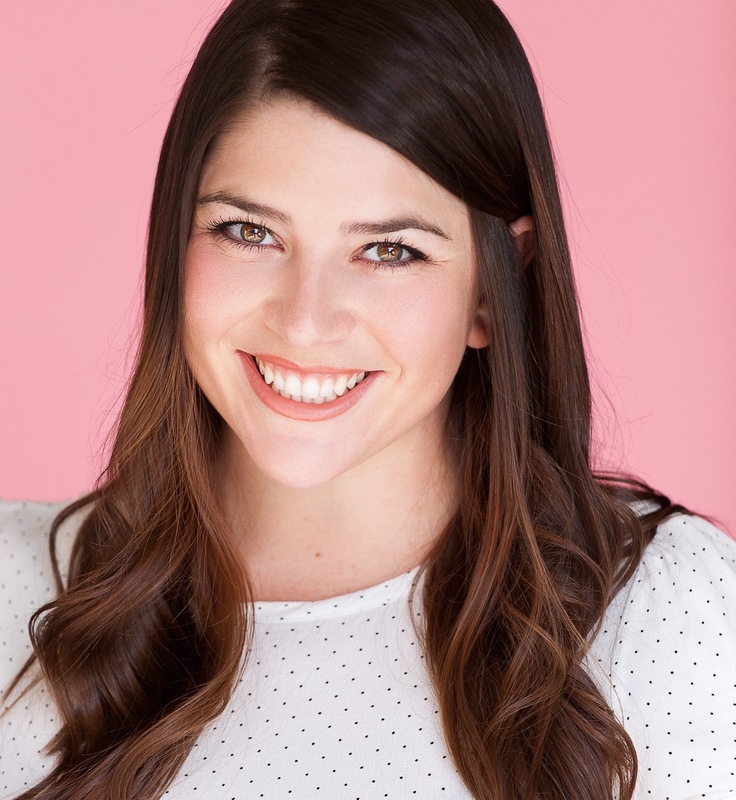 Our second-ever ITLT guest blogger is my friend Lindsay who is sharing a wonderful little project that falls right into place during October, domestic violence awareness month. We've actually now known each other for twenty years! When did we grow up? 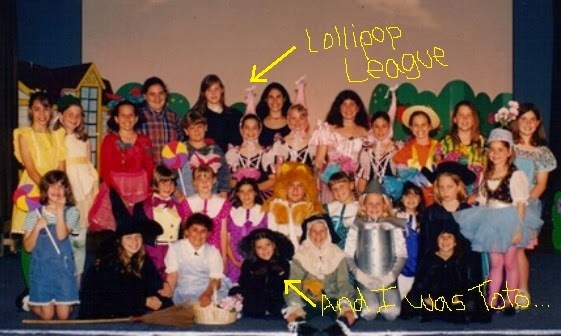 She'll explain how we met and how we've come to be where we are now, but first, we dug up our first picture together ever! Hello dear friends at #TeamITLT! I’m honored to be guest-blogging here today and share a special and impactful project with you. 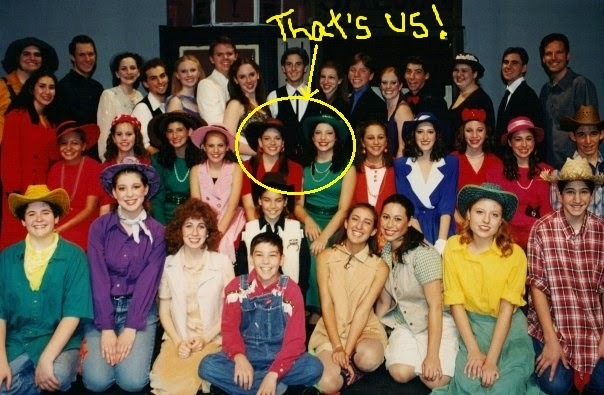 Joan and I grew up performing in community theater together – in fact, here’s a fun photo of us back in 2003 (I think) both cast as Tess in Crazy for You. 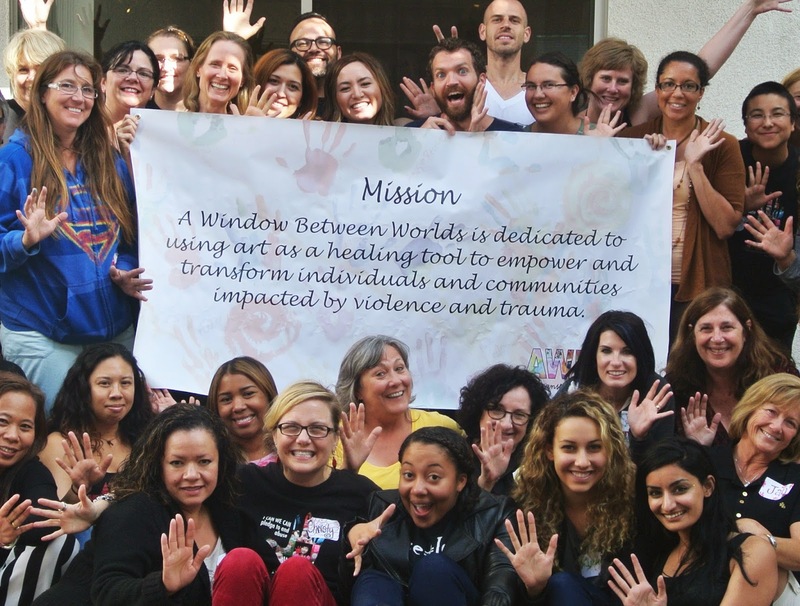 In 2013, I joined the staff at A Window Between Worlds (AWBW), a national nonprofit using art as a healing tool to empower and transform individuals and communities impacted by trauma and violence. 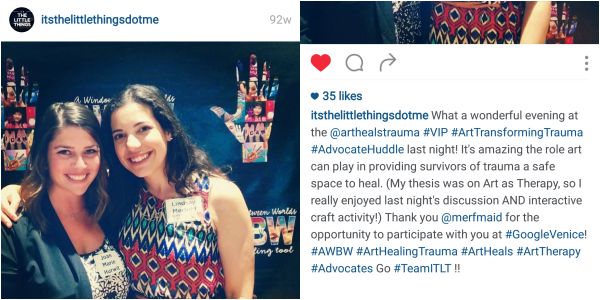 As Event & Volunteer Coordinator, I encourage volunteers and advocates to tap into their creative side as they support our healing art programs. I also coordinate AWBW’s fundraising and special events – helping to share the mission to new communities. In my personal life, I also serve on the Board of Trustees for the Hollywood Arts Council, and do anything I can to help keep art as a resource for all. AWBW has used art to support survivors in healing from abuse and trauma since 1991. Over the years we've discovered that art is also a powerful way to engage and motivate the community to get involved in the movement to end domestic violence and sexual assault. 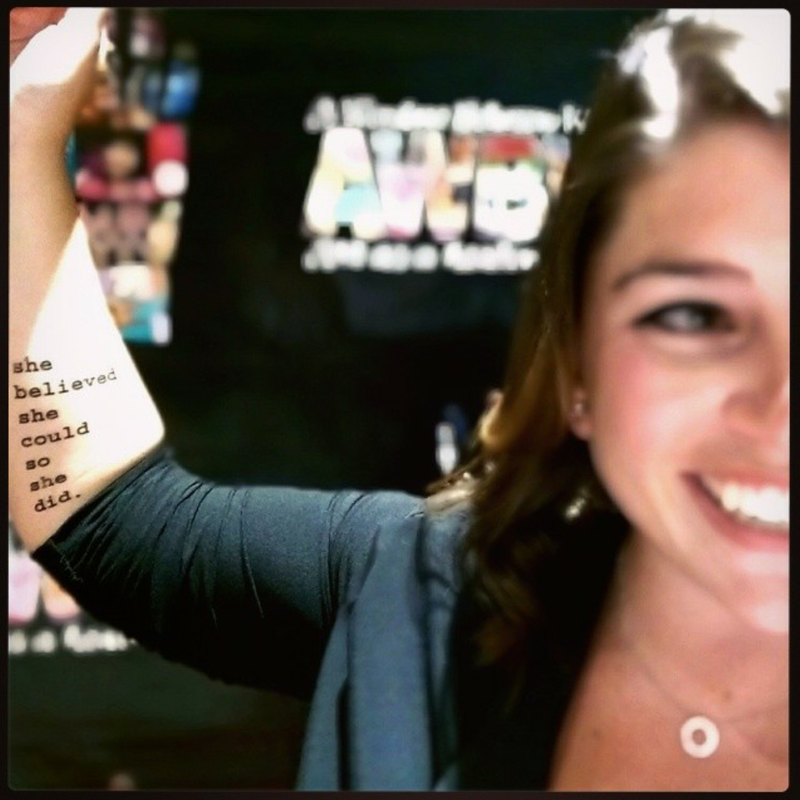 Thus, AWBW created the I CAN WE CAN project as a creative, appealing, interactive way for you to look at what you CAN do to end abuse. You have the opportunity to claim your I CAN in the comfort of your very own home. 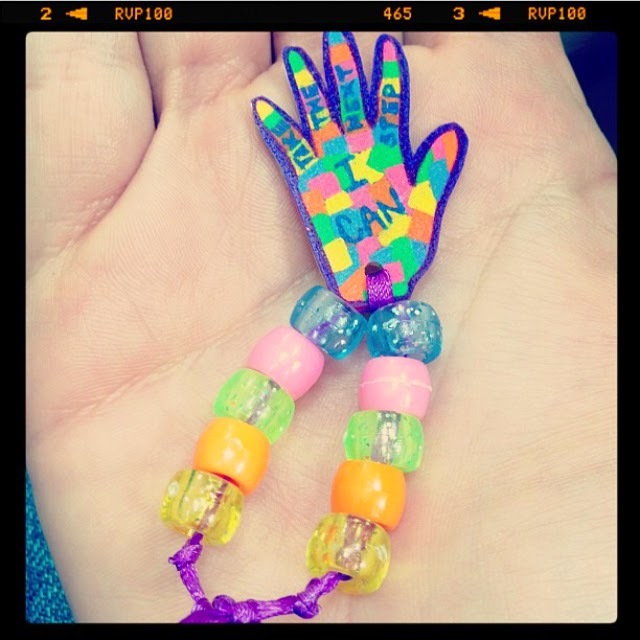 By claiming your I CAN and uploading a photo of your creation to the I CAN WE CAN online gallery, your creation will join more than 1,700 hands across the country that are rising up to end abuse. Here's how you can connect to the I CAN WE CAN movement. a) CREATE – Use our self-led workshop to create your own I CAN artwork or lead a peer group workshop. You can paint directly on your own hand, trace your hand on paper, or use a shrinky dink template! b) CONNECT – Get inspired viewing others’ stories and artwork and show support by leaving a comment. c) CHANGE – Upload your I CAN hand to our community online gallery and share your artwork on social media! Now you're part of the I CAN WE CAN community! I CAN WE CAN is about believing that we can end violence by noticing and embracing what each of us CAN do to end violence and making a commitment to ourselves for non-violence. Using hands as our canvas, we will create a personal pledge. As you create, please honor whatever comes to your mind. It may seem "too small" to be important or "too big" to be possible, but please know that it is just right. When you honor your heart, you can create a change that ripples out from you to those around you to the community at large as part of a global change. Your I CAN, no matter how small or big, is part of changing the world! October is Domestic Violence Awareness Month, and the Los Angeles City DV Task Force has chosen the I CAN WE CAN project as the theme for their annual DV Awareness Day event. We welcome you join AWBW, the LA City DV Task Force and numerous LA City Council members and (in person or electronically) on October 10, 2014 in saying I CAN WE CAN end domestic violence! For more information on getting involved in this special day, please email me at events@awbw.org. Join the I CAN WE CAN conversation on Social Media. Share your I CAN use the hashtag #ICANWECAN. “Like” A Window Between Worlds on Facebook, and follow us on Twitter and Instagram. To learn more about the many ways to get involved with A Window Between Worlds, visit www.awbw.org. Join as an advocate, volunteer or supporter today! HAPPY OCTOBER! Among other important causes, October is recognized as Domestic Violence Awareness Month. This month we will be providing you with a bunch of wonderful ways to honor and spread awareness of this important cause. This first project comes to us from the amazing people at DoSomething.org of which I am a fan and a member! so this is exactly what you should do with your old phone! A woman is battered every nine seconds in the United States. One in four women will experience domestic violence during her lifetime. Women ages 20 to 24 are at greatest risk of becoming victims of domestic violence. Lately, the media has brought a lot of attention to the issue of domestic violence, and people who are not well educated in the subject often ask: "Why didn't she leave?" Well, we can't presume to fully understand these very complex relationships, and even asking this question is a form of victim blaming. Instead, I encourage you to explore the many reasons and situations why women have stayed in violent relationships; it's a generously and bravely shared topic on twitter recently, simply search: #whyIstayed for some honest insights. Sometimes, a lack of alternative housing leads women to stay in or return to violent relationships-- and this is where our project comes in. Most of the parts of your cell phone can be broken down and recycled to make new products. 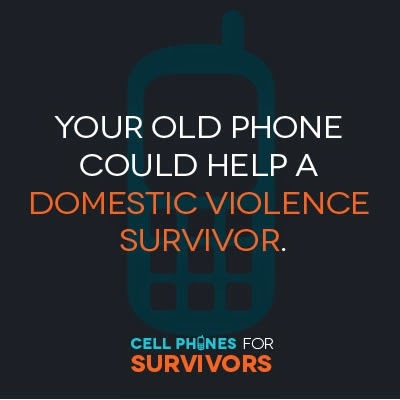 The money from your recycled phones will be turned into funding for Safe Horizon to provide a safe place for survivors and their families to stay. Dust of that old phone; even if it's broken, parts can be salvaged. Collect your phone donation(s) in a padded envelope or small box -- only phones and batteries, no chargers or accessories. Print, cut, and paste the free shipping label. Don't forget to include your return address, and send it off! Every $50 raised will provide bedding for a family staying at one of Safe Horizon's shelters. 100% of the wholesale value of the phone will be donated to benefit survivors. The value depends on the quality of the phone and whether it can be resold or recycled. If you have more than 10 phones, email ryan@secondwaverecycling.com for a special label. To talk or text The National Dating Abuse Helpline 24/7. Please go to a safe location and contact the helpline by texting “loveis” to 22522, calling the helpline at 1-866-331-9474 (1-866-331-8453 TTY) or you can chat online with the helpline.